While we’re on the topic of God’s grace I want to address my hands. Actually it is my skin. 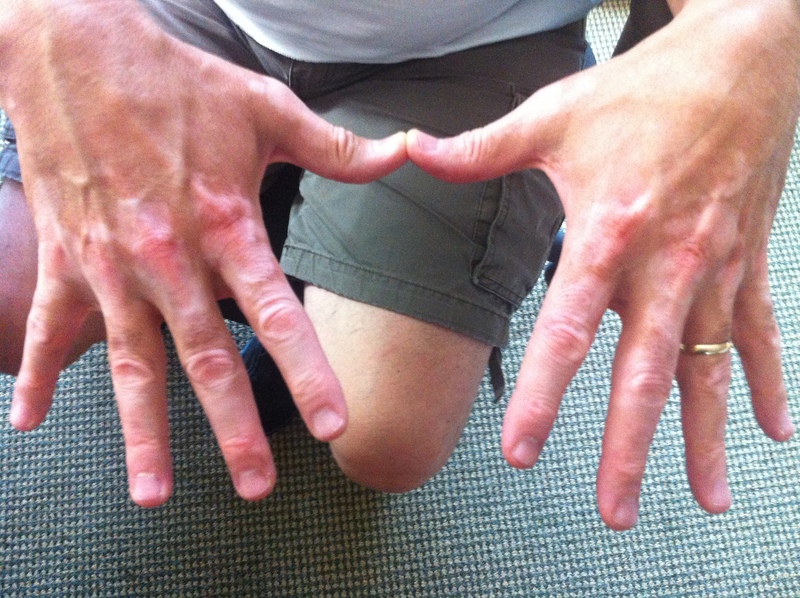 At 48 years of age I developed a condition that arrests my pigment-producing cells, mainly on my hands. It is an autoimmune ‘thing,’ and is somehow related to arthritis, though I have no pain, and the condition is non-life threatening. At the end of the day it is just a discoloration and nothing more. The condition is called Vitiligo, a name nearly as ugly as the actual condition itself. I would have preferred something to the effect of ‘Surfer Skin,’ or ‘Sniper Hands’ – some studly title that would have every other guy desperately attempting to mimic the condition for himself. I have been to skin docs, had ultra light treatments and even regularly take vitamins that are supposed to help what could conceivably be a reversible condition – to no avail. Sometimes, as Christ-followers, we get the grace ‘thing’ wrong. As much as we would like to turn back the clock on decisions, sins and events that have left us wounded or regretful, to live in God’s grace is to believe that He accepts us in spite of the fact that we can’t alter our histories. In fact, if we could turn the clock back and change our worst decisions, reverse our most embarrassing moments, and un-sin all our sins, then God’s grace would be irrelevant. God’s grace won’t grow a leg back from someone who got high and lost it in a car wreck. It will give them relief from thinking that they need that leg to be a whole person in God’s eyes. God’s grace won’t turn back the clock to make someone undivorced. It will cause a divorced person to understand that in God’s eyes they are no less human. God’s grace won’t remove the history that causes our shame. It removes our shame in spite of our histories. This is really the point of Hebrews 11:21, where the writer offers, By faith Jacob, when dying, blessed each of the sons of Joseph, bowing in worship over the head of his staff. Jacob never could shake what Brennan Manning aptly calls, that ‘victorious limp.’ He always needed that blasted staff. God crippled Jacob when he finally came to terms with his deep and damaging dishonesty. And He left him a lame man – for life. And that was okay for Jacob. Then God gave him a testimony. If we’re honest with ourselves, we really don’t want God’s grace. Maybe a more accurate way of putting it is that we don’t want to have to need it. We want our records unblemished because of our own merits. I get that – really I do. We want our former selves when we deluded ourselves into thinking that we were without problems or sins or blemishes. In a sense, we buy into the lie that says we never needed God’s grace until we blew it! Kind of like my saying that until I got Vitiligo my skin was perfect. Like I never had a zit! What this means is that there is something in all of us that is desperately afraid to place our value in someone else’s hands (ironically), even when they are God’s. But that is exactly what we do when we live in His grace. It doesn’t make us perfect. It does one better. It relieves us of the need to be. The truth is that the Vitiligo bothers me more than anyone else, though from time to time I catch someone looking at it, and then pretending to not look at it because they realized that I caught them looking at it. And sometimes it bothers me so much that my frustration is no longer merely an internal struggle, but an actual rejection of those who love me regardless. Friend, you will never change your history, and you will never be able to undo what you most regret. But this is not the prerequisite for God’s grace in your life. Your brokenness is. So live in that reality. Thanks, Mike, for again giving us the true picture of grace! God no longer remembers any of our sins past or future for when we are in Christ and He in us, God only sees His Son who gave All for us. We can give nothing more to His finished work on the cross. We are forgiven. Can you forgive? Thanks for a very needed reminder of God’s love and grace. I appreciate your message. You are currently reading Grace With Skin On It at unfinished1.